The most lifelike dead animals anywhere. You probably thought this dear was alive. And this coyote was alive. And this pheasant was alive. NOPE. They're dead. They've been taxidermized by Chuck Testa. Ojai valley taxidermy. Chuck Testa runs a taxidermy business in the Ojai Valley. He has a small but fascinating Youtube channel, which provides Tuesday Taxidermy Tips on (amongst other things) bear care, skinning out a bear head, and how to measure a bear skull. I think I'd be equally scared by a stranger in my bed as a bear in my bed. Round about the bear in bed was when I started laughing so hard I fell out of my chair. "There's a bear in my bed!" "But I taxidermize the most lifelike dead animals anywhere!" "That's nice, Chuck Testa. I'm calling the cops." Also: who cares where it "came from?" We don't all live on Reddit. I totally thought this was going to be parody. See, what you really need to do is link to R&L Local Commercials because their commercials are off the hook. White people and black people like our furniture. No one makes it rain like Roger. Let me cut your hair, I really need the practice. Oh well if we're talking about hipsters poking fun at local commercials, nothing touches Pathway Foods (at least not without latex gloves on). I live near Ojai and am not at all surprised to learn that the local taxidermist is also a Nazi memorabilia enthusiast. Funny commercial, though. "Taxidermied" always sounds wrong to me, like the sort of half-fake word you make up off the top of your head because you've had a brain fart and can't remember the real one. I dunno. Like it ought to be "taxidermized" or "taxidermated" or "entaxidermened" or "their derms have been taxed" or something. Wow. I just totally fucked that joke up. Pretend I had told it in the correct order, K? My father used to make the opposite of this video. Ever Christmas he'd take a video of the family opening stockings and presents, the relatives visiting, the occasionial tail of a cat fleeing the scene, and... our Samoyed dog doing a remarkable impression of one of those sheepskin rugs. Later in the day, he'd make a point of taping a scene with the dog elsewhere in the house - just to prove that she had moved and was still alive, despite appearing motionless and possibly dead. A taxidermist made a presentation at a local career symposium when I was in high school. Mr. Testa's commercial has made me ashamed for not paying more attention back then. Awesomest ad since the 'My Dog Spot' ads with elephants and lions ..
Tim and Eric produced this ad, right? Nope, Rhett and Link did. The puns and innuendos...oh my god. Just be glad I didn't say, "The puns and innuendos...oh dear." Mrs A and I have a running joke where whoever dies first will be stuffed and made into an animatronic version of ourselves to freak out visitors. We may be more serious about this than we think. Also, nice to see Gene Parmesan found a new gig. One of my wife's cousin was, um, into taxidermy. He was on the quiet side but otherwise wouldn't strike you as out of the ordinary. That is, until you saw his room. He did pets, unlike Chuck Testa. Mrs A and I have a running joke where whoever dies first will be stuffed and made into an animatronic version of ourselves to freak out visitors. Guess what, kids? 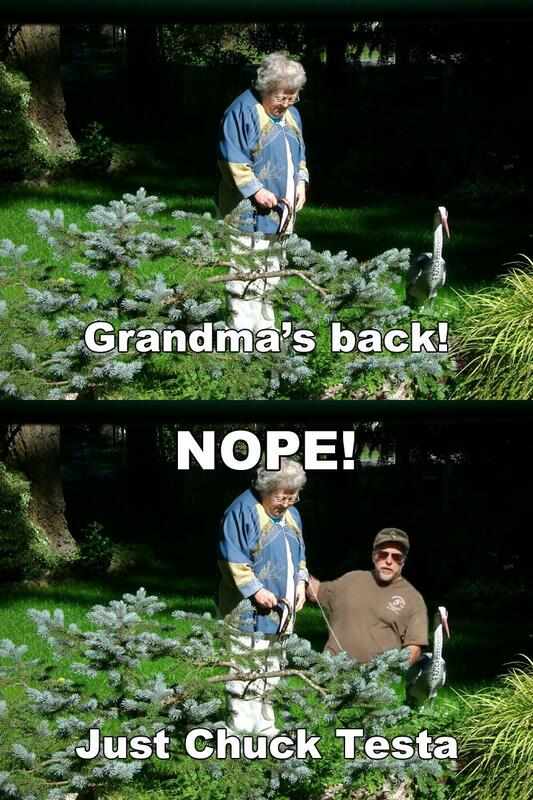 Grandma's back! I did not expect to watch a guy skin a bear head today. Gorillamask jumps on the Chuck Testa bashing. You probably thought this shark was alive. Well, that's one great commercial, you gotta give him that. I need to freedomize this Ford Explorer! Officer 1: So can you identify the carjacker sir? Man; I don't know, It all happened pretty fast. I think he was blond, maybe 124 pounds. I didn't notice any clothes but I'd say it's horns were about a foot long? Officer 2: I'm sorry, what did you say? He had horns? Man: Pretty sure. I was driving out of the garage and suddenly he was just right there, the next thing I knew I was on the ground and he was pulling away in my car. I can still here the sound of his hooves pulling the door closed. Officer 1: You've been through a terrible trauma sir, it's only expected that your memory is a bit jumbled. Man: No sir. I know what I saw; at first I thought it was alive, but Chuck Testa, that guy on TV was totally dressed up as an antelope when he stole my car. I looked at it and thought that 'Ol Chuck was wearing an 6th SS Mountain Division Nord cap, because of the edelweiss badge on the side. I pointed this out on Rhett & Link's Facebook page, but evidently I was the only one who cared. The only conclusion I could draw is that neither Rhett, nor Link, nor many of their fans could identify a Nazi uniform cap on sight, having apparently never seen Battle of the Bulge. "Oh no there's a bear in my bed!" "Oh no there's a guy in filthy clothes and what is clearly Nazi memorabilia in my bed, and also the preserved outer surfaces of a dead bear in my bed at the same time!" "... Okay yes. Got me."